I’ve answered over 1,800 questions on Libertarianism on Quora since I joined that platform back in 2013. That makes me their “Most Viewed Writer” on Libertarianism. Quora also designated me as a “Top Writer” in 2014, 2015, 2016, and 2018. Encouraged by some of my 15K followers, I’ve committed to write a book. If old truths are to retain their hold on men’s minds, they must be restated in the language and concepts of successive generations. What at one time are their most effective expressions gradually become so worn with use that they cease to carry a definite meaning. The underlying ideas may be as valid as ever, but the words, even when they refer to problems that are still with us, no longer convey the same conviction; the arguments do not move in a context familiar to us; and they rarely give us direct answers to the questions we are asking.— The Constitution of Liberty (1960). The old ideas, the eternal ideas, must be reborn in each age’s vernacular, with a cadence of the times and references and examples that have relevance and immediacy to the reader. That is part of what I’ve tried to do on Quora, and what I am to do in my book. The plan is to rework some of my Quora answers into essays, and combine these with substantial new material, all arrange it all in thematic order. 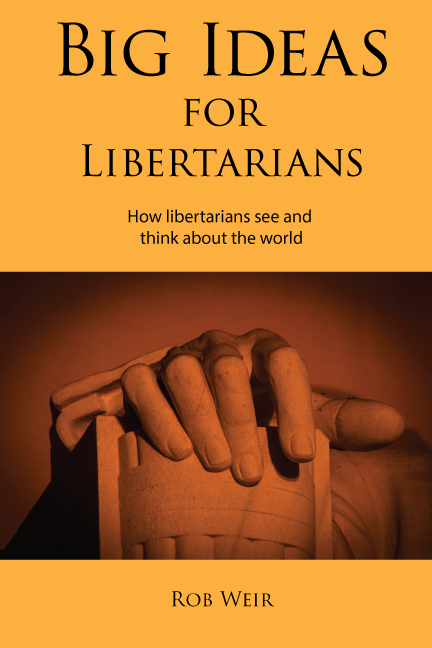 The working title is Big Ideas for Libertarians. I am aiming to present a set of around 30-50 key libertarian concepts which show how libertarians reason about the world. Insights, frames of reference, heuristics, models, rules—these could go by many names—but think of things like: Self-Ownership, Negative Rights, Victimless Crimes, Regulatory Capture and Subsidiarity. These are concepts that we libertarians have readily at hand, the mental paths we tend to follow, part of our common intellectual heritage, as certainly as the Marxist instinctively sees the world in terms of Exploitation, Alienation and the Labor Theory of Value. If you’d like to be “in the loop,” and hear more as I make progress, then I invite you to sign up for my mailing list. I’ll share more information as I progress, maybe float some ideas by you, solicit input. At some point I’ll also reach out to see if anyone wants to slog through a draft and send feedback. And, of course, when it gets close to release, I’ll be looking for reviewers interested in getting an early look.